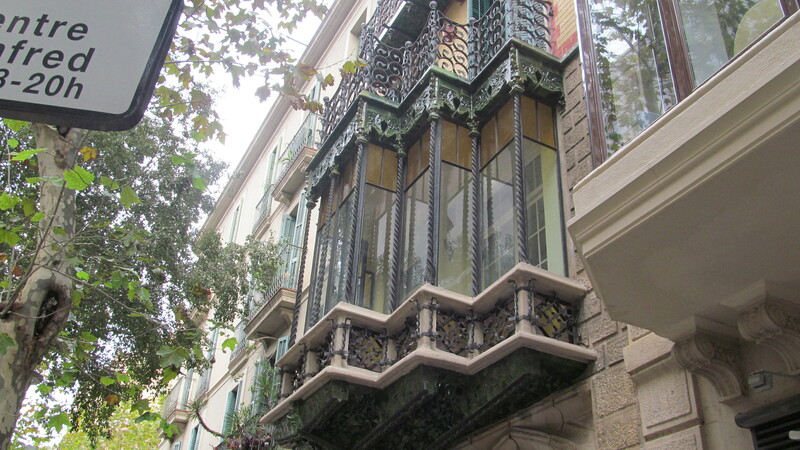 Look at these photos of the balconies of Barcelona. The city apologizes for its occasional cloudy periods. 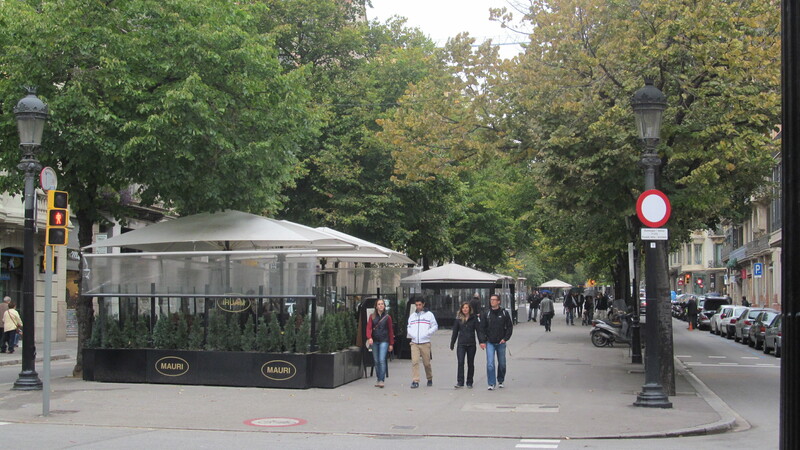 The shop directly below is a restaurant – bar; on the second floor is a hair salon. Just imagine enjoying tea in this room, watching the world pass by. Here is the complete building. Neighbourhoods with similar balconies, some more basic, some amazingly more elaborate, spread in all directions. 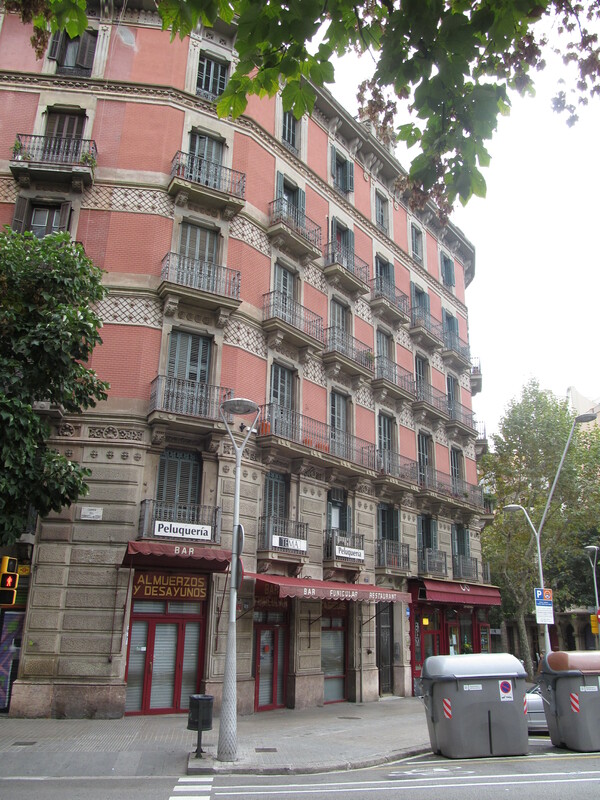 These are located, on reasonably quiet streets, within a easy 15 minute amble to Plaza Catalunya, Barcelona’s central square and the gateway to Las Ramblas, their kilometre long pedestrian street. All within easy reach of subway stops. Many look out over their own pedestrian ways. 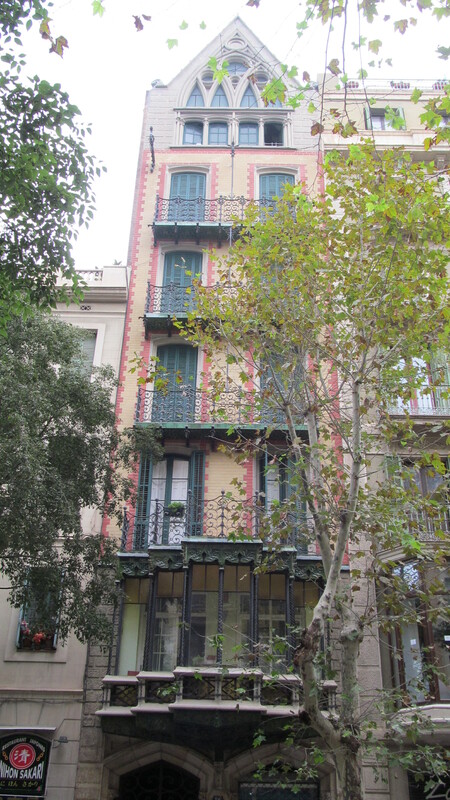 One of Barcelona’s innumerable ‘third spaces’. On a hot summer evening, it might keep one awake, but surely you would be contributing to the animated conversation, laughter and song. Here’s the cunning plan! You have probably seen it coming. A bunch of us will throw a chunk of euros in the pot and buy one of these places, just above tree level, that we can share over the course of a very long year of warmth and sunshine. Air Canada flies direct from May to October. 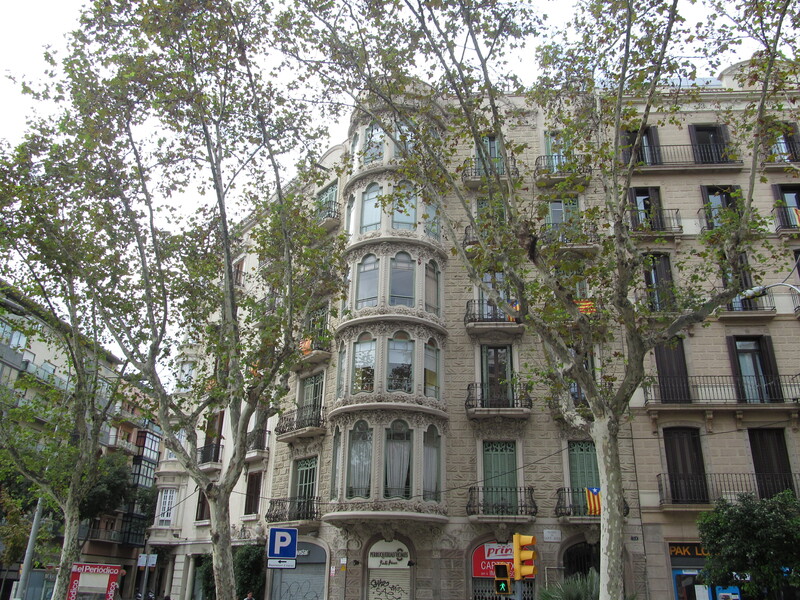 Remember the Mediterranean is a few subway stops away and there are a raft of Gaudi buildings within 10 minutes in whatever direction. 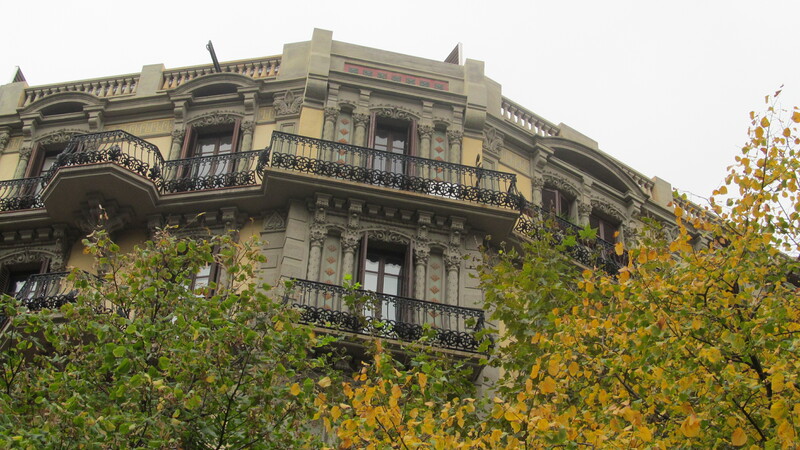 Cafes, restaurants, tapas bars, chic shopping, Barca futbol, medieval architecture, the Picasso museum among so many museums (one for chocolate), the list is endless. 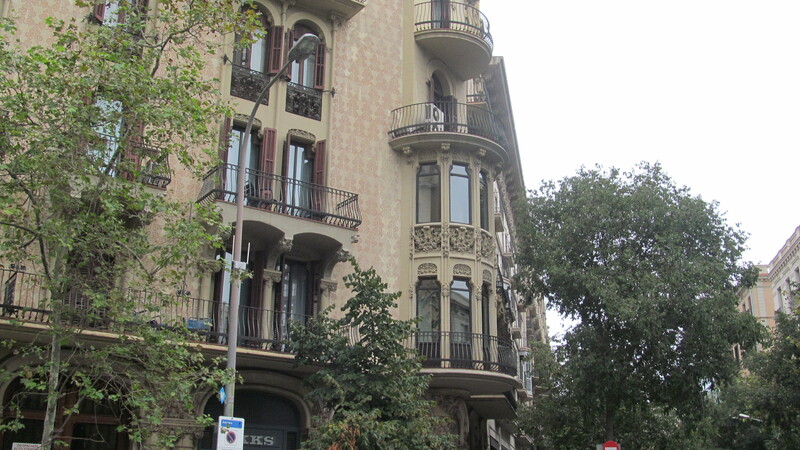 And, here is my favourite balcony, so far, just above street level, but with similar ones reaching up three or four stories. A bunch of us could come over together, spend some days wandering the streets trying to reach a compromise on the perfect one, hours negotiating in one of those bars or restaurants. Wonderful to dream, the ideal location of most cunning plans! Oh, by the way, I would be perfectly willing to sacrifice my time and be here regularly to take care of the place, act as tour guide extraordinaire and give introductory Spanish lessons. One more! De acuerdo! And I know that I have only walked a small fraction of these streets. Check out the comments and feel free to add your own, although at times I cannot figure out how to save all the comments. I was not blogging in Valencia; I was in the only hotel in Spain that insisted on charging a per diem for WiFi, for very slow WiFi, at about $8 a day. I have praised this hotel in every other way on the reservation site but have said very simply that this situation is intolerable. A farmhouse in the Pyrenees provided me with rapid, free WiFi (in Spanish, WeeFee). 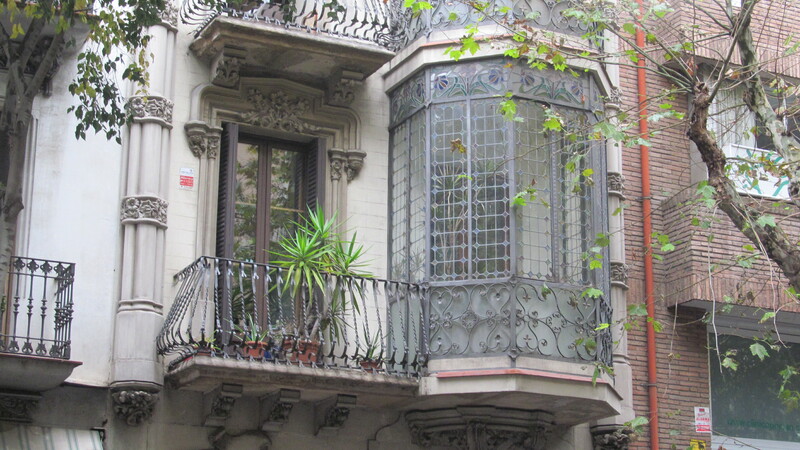 This entry was posted in Barcelona, Spain, travel in Spain, Uncategorized and tagged balconies of Barcelona, modernismo on November 4, 2012 by agnotarte.